Your protein boost in the morning. Made from our unique fine flake soy. Get yourself some protein on your spoon! 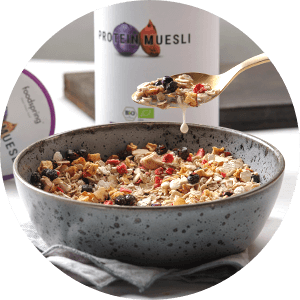 We have found the perfect balance between delicious and healthy for our Bio Protein Muesli: Our Bio Protein Muesli is packed full of protein for your muscles. Delicious fine flake soy and the very best nuts, seeds and berries. Contains more than 29% premium quality plant protein. 100% vegan. No added sugars or chemicals. Makes you feel full for longer without bloating. Soy has a pretty bad reputation in some circles .... We don’t think that’s justified! After all: not all soy is the same. We process the sprout with a clear understanding of its properties and without any chemicals. That way, we get the best it has to offer out of it. Super healthy stuff never tastes good. You couldn’t be more wrong. It is delicious!! Every ingredient in our Bio Protein Muesli is a bullseye in terms of taste: There is no added sugar, but the fruit is deliciously sweet. 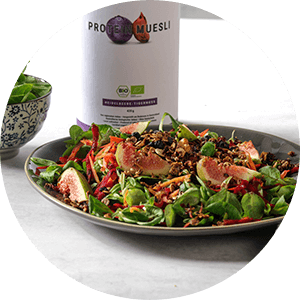 It is packed full of vital nutrients for your body and you will absolutely love how great it tastes. A varied and balanced diet and a healthy lifestyle are essential. Not suitable for sufferers of the following allergies: soy, spelt, cashews. May contain traces of lactose. A varied and balanced diet and a healthy lifestyle are essential. Not suitable for sufferers of the following allergies: soy, almonds, cashews and hazelnuts. May contain traces of gluten, lactose. Use a spoon to stir the content of the tub thoroughly to evenly distribute the flakes, nuts and berries. Measure 60 g (approx. 6 table spoons) and mix it with milk, a milk drink or juice. You want more variety? We have come up with some pretty delicious recipe ideas for our Protein Muesli for you. Our Protein Muesli is always delicious, no matter how and when you eat it. With your favourite milk type. Our Protein Muesli is not fussy. Try it with cow milk, almond milk, oat milk or with a rice drink. It will always taste great. Whatever way you like it. With yoghurt or cream quark. Yoghurt and cream quark taste great with our muesli. For a more exotic touch, try some coconut yoghurt. Add some to your fresh salad or sprinkle it on a savoury or sweet snack. Our Protein Muesli gives everything you love to eat a little extra taste boost. Who should use protein muesli? Organic Protein Muesli by foodspring is based on fine flakes sourced from German and Austrian-grown organic soy beans. 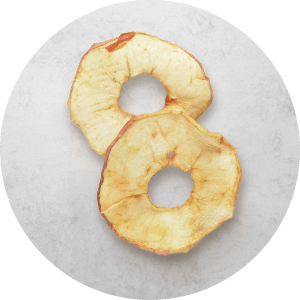 These are grown and processed exclusively on a family-run organic farm near Lake Constance. The beneficial micro climate in the region is uniquely suitable for growing soy on extra fertile soil. The production and manufacturing process - from sowing to the end product - is closely monitored by the employees of Hofgut Storzeln to ensure compliance with the high quality requirements for organic certification in Germany. The processes of local farming to strict Bioland guidelines are at the heart of the high product quality soy cultivated in Germany and in the Austrian Burgenland region. Bioland certification means foregoing factory farming, chemical fertilisers and pesticides. 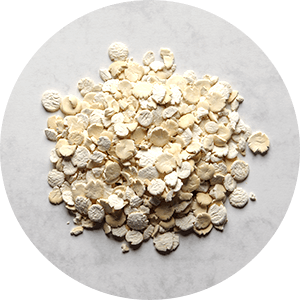 The special production process for the fine soy flakes ensures a particularly high protein content in our muesli. As an added bonus, the soy beans are gently de-oiled and their fat content is reduced by up to 80%. The low glycaemic index of the soy flakes makes our protein muesli an excellent helper for well-balanced weight-loss diets. 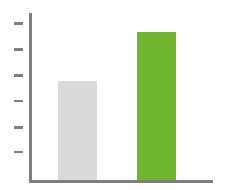 Men usually avoid soy because of its phytoestrogen content. 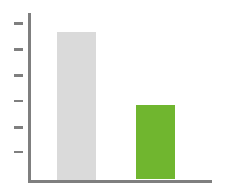 Many are afraid that they might experience hormonal changes with the intake of soy. 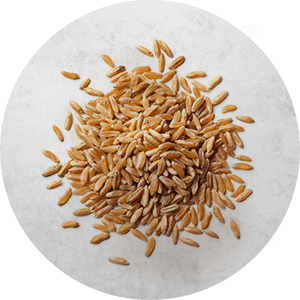 We are aware of these doubts and have come up with a great solution: The intelligent production processes of our Protein Muesli reduce the phytoestrogen content by up to 90%, just to be on the safe side. Muesli simply is THE breakfast food. Prepared with fruit, yoghurt, cream quark, fruit juices, milk or vegan milk alternatives, muesli is never boring, easy to prepare and gives you the energy you need to get through your day. But what does “muesli” actually mean? It originally came from Switzerland. In Swiss dialect, “muesli” means something like “little mash”. The physician and nutrition reformer Maximilian Oskar Bircher-Brenner created muesli around 1900 as a nutritious and light evening meal. Which also explains the brand name “Bircher Muesli”. Whether or not Bircher actually came up with the recipe for muesli himself or if he maybe encountered the traditional recipe on one of his hikes from one little alpine village to the next, is not entirely clear. In its original form from over 100 years ago, muesli consisted of oat flakes, apples, nuts, lemon juice and sweetened evaporated milk. Today, there are countless muesli versions available around the globe. Most muesli types, however, are not really that healthy. How much sugar and how many calories are really hidden in a muesli is often not easy to see at first glance. That is why it is advisable to always have a closer look at the ingredients to make sure you are making a healthy choice. The high protein content of our vegan protein muesli helps support muscle building. The additionally included seeds and berries round off the nutrient profile to perfection. A sufficient supply of carbohydrates in the morning ensures an optimum energy supply for the whole day. Fine soy flakes have a low glycaemic index. The vegan soy protein also means a high fibre content. That means that our Protein Muesli keeps you feeling full for longer and helps to prevent binge eating. What’s more, our Protein Muesli supplies your body with the vitamins and minerals it needs. Seeds and berries contain high levels of potassium, zinc and magnesium, Omega-3 fatty acids, vitamin B complexes and antioxidants. Our Protein Muesli is always delicious. Try our Overnight Muesli, have it traditionally with cow’s milk or with a milk drink made from oats or almonds. Recipes differ as to how many grams of protein muesli and how much milk is needed – and of course how to best eat your muesli and when. You decide, which type of yoghurt you want to have with your muesli: Greek yoghurt or low-fat quark topped with fresh fruit will taste simply amazing. But why do people usually have their muesli with milk? Having your Protein Muesli with fruit juices is as tasty as with milk. Breakfast is an essential part of any nutrition plan for successful weight loss. Many people tend to skip breakfast to cut calories at the start of their day. That is definitely NOT a good idea! Anyone skipping breakfast will suffer energy deficiencies, which can later in the day trigger binge eating. That's why it is important to make breakfast a fixed part of your day. Eating breakfast lays the foundations for a productive day. The perfect choice for breakfast is a combination of high-quality protein and complex carbohydrates. Our Protein Muesli is the perfect choice. Our unique and delicious fine soy flakes are the best possible source of protein. The seeds and berries in our muesli provide additional complex carbohydrates. These are critical for boosting energy reserves in the body at the start of your day. Make sure to keep an eye on the sugar added to the muesli and the amount of calories you will consequently consume. The organic Protein Muesli by foodspring contains only the natural sweetness from fruit. Calculate your individual daily calorie requirements to make sure you eat the right amount of muesli for breakfast as part of a weight loss diet. The high protein content will make you feel full for longer and delivers valuable protein building blocks for muscle maintenance. Fibres also contribute to avoiding hunger pangs. 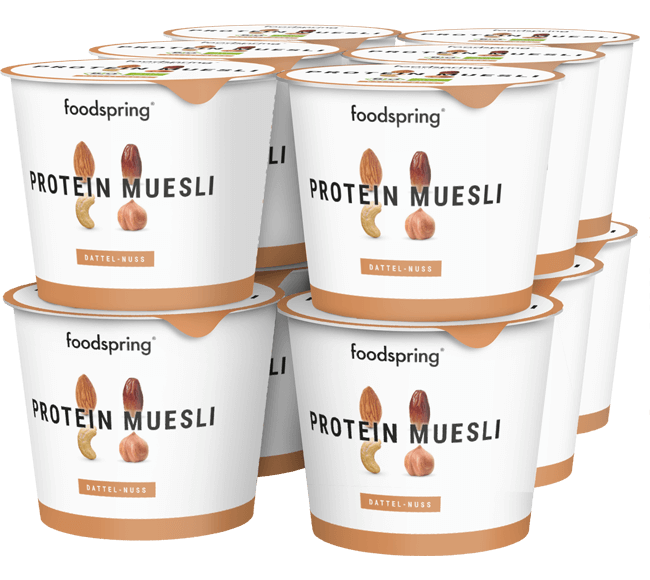 Organic Protein Muesli by foodspring is the perfect muesli choice for better fitness, used as a Power Pack Muesli it is great for runners and in the practical To Go Cup, you can take it with you wherever you go and prepare it whenever you want it. Organic Protein Muesli delivers valuable protein building blocks for muscle building and muscle maintenance during weight loss diets. The market is overflowing with mueslis that offer a low quality nutrient profile. The products often attempt to hide unhealthy ingredients. They are often full of added sugar and base their taste solely on artificial flavourings, colourants and preservatives. Organic Protein Muesli by foodspring is made exclusively from soy protein produced at a family-run organic farm in the Lake Constance region. The entire production and manufacturing process – from sowing to the finished product – takes place in Germany and Austria in accordance with strict Bioland standards. Organic standards give you the peace of mind that you will not support factory farming or the use of fertilisers and pesticides by purchasing that product. Products bearing the Bioland seal guarantee maximum purity and continuous quality assurance in their production. 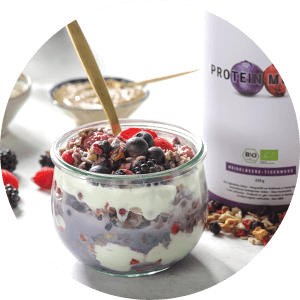 The vegan Bio Protein Muesli by foodspring is 100% organic and its natural formula is refined only with natural flavourings, nuts, berries and seeds from certified organic cultivation. What makes your protein muesli a better choice than other breakfast flakes? Not all mueslis are the same. Off-the-shelf supermarket products are often lacking in nutrients, are veritable sugar bombs and generally promise a lot more than they can deliver. Our Protein Muesli offers the perfect balance between delicious and healthy: It contains plenty of plant protein from fine soy flakes and complex carbohydrates instead of empty calories. Perfect to kick-start your day or to get you back on your feet after a big workout. I have seen mueslis with a higher protein content? True. But do you really enjoy munching on cardboard? Probably not. That is exactly why you will bin those other protein mueslis latest on day three. We have developed an organic protein muesli that tastes delicious every single day. 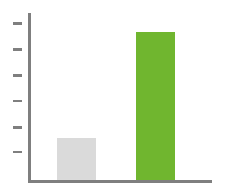 We feel that it is better to sacrifice 2-3% protein for an optimal combination of natural nutrients, certified organic ingredients and real taste. Why is your organic protein muesli dearer than my normal muesli? Because we insist on top quality ingredients. Organically grown ingredients and a patented manufacturing process for a protein muesli like no other: 3.5 times more protein than standard breakfast flakes. Plus hand-picked nuts, berries and dried fruit for a perfectly natural, great taste. Our tip: Ordering our practical 12-pack and the 420 g tub together will keep you well stocked with delicious muesli and saves you money as well. Where does all that protein in your organic protein muesli come from? The soy beans used for our organic protein muesli are gently de-oiled after harvesting. Then they are flaked and a large portion of the carbohydrates are extracted. In conjunction with the protein content of the various nut types, the protein content of our organic protein muesli is elevated to the maximum – to 3.5 times the protein content of standard mueslis, to be exact. Does soy upset my hormone levels? soy contains naturally occurring phytoestrogens. Contrary to popular belief, these are not hormones as such, but phytochemicals that are similar in structure to estradiol 17ß, the natural female hormone oestrogen. There is no scientific proof that a moderate consumption of soy impacts hormone levels. For our Protein Muesli, we’ve taken preventive measures and naturally process our soy flakes to remove nearly 90% of the phytoestrogen content. Better safe than sorry, we say. Can I get your Protein Muesli in a big tub as well? Sure! We offer our Protein Muesli not just in the practical To-Go Cup, but also in a big 420 g tub for at home. That will make getting your muesli fill every morning super easy. Plus you won’t have any nightmares about not having any muesli at home ;). Protein Muesli 12 Pack will be back in stock shortly.